Retail investors are increasingly opting for systematic investment plans (SIPs) in mutual funds as the industry has garnered close to Rs. 7,000 crore through this route in April, 2108 a surge of 57% from the year-ago period. This followed investments of over Rs. 67,000 crore through SIPs by the fund houses in 2017-18 and more than Rs. 43,900 crore in the preceding fiscal, as per the Association of Mutual Funds in India (AMFI). The higher interest in SIPs could be attributed to robust performance of equity schemes and investor education initiatives taken by industry body Amfi, Edelweiss Mutual Fund CEO Radhika Gupta said. SIPs have been the preferred route for retail investors to invest in mutual funds as it helps them reduce market timing risk, she added. Further, she said that investors are not showing interest in investing into traditional asset classes like real estate and gold and preferring financial assets such as MFs. Moreover, SEBI’s new guidelines of reducing the MF expense ratio to 0.05% (5 basis points) from 0.2% (20 basis points) will create a lucrative environment for investing through the SIP route in the market. As per the latest data, the industry garnered about Rs. 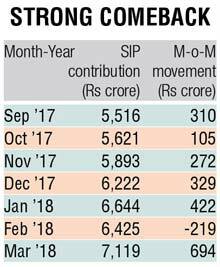 6,690 crore in April through SIPs as against Rs 4,269 crore collected in April last year. MFs have 2.16 crore SIP accounts through which investors regularly invest in Indian mutual fund schemes. SIP is an investment vehicle that allows investors to invest in small amount periodically instead of lump sum payment. The frequency of investment is usually weekly, monthly or quarterly. It is similar to a recurring deposit where investors deposit a small or fixed amount every month.